Homemade chicken noodle soup, made from a whole chicken in an electronic pressure cooker. If you've been a friend of this blog for any amount of time, you already know that I love my food cooked the old-fashioned way - in the oven or on the top of the stove, low and slow. It's part of the whole process that birthed this recipe website to begin with - connecting to my Mama and Grandma through cooking, after Hurricane Katrina changed my entire career path overnight. There's just something magical that happens with that low and slow process that makes you understand the whole emotional connection to our past while cooking for someone in the present, and how it literally explodes the flavor in a dish that just doesn't happen any other way. But, just like the rest of you, my life is busy with work, family, events and errands and the craziness of life, so I also enjoy using my convenience appliances from time to time, just like anybody else - microwave cookers, crockpots, infared ovens, countertop grills and electronic pressure cookers - I own and use them all. I'll be the first to say though, there is some difference in flavor to my taste buds, though all of them still produce good tasting food and the sacrifice for time is sometimes the winner. That'd be the case with this soup too. I have a lot to chat about today so if you're in a hurry, just scroll on further down the page for the full recipe and a printable link. I was in need of chicken soup in a hurry the past couple of months. Since my surgery last year, it's been a rough year with rebuilding my immune system at my age and though that is common after surgery I am now told, it's meant that I've easily picked up viruses despite the vitamins, antioxidants and probiotics I consume. I dunno... maybe it would have been worse without them, but I don't know how, because in late January I was gifted with the flu - 103 fever, body aches, just the general malaise that comes with it. About the time I felt better from that, in came a sinus infection, followed by an eye infection, followed by an upper respiratory infection - all of it viral and nothing that could be helped with an antibiotic. I just had to suffer through it and treat the symptoms. It was an awfully rough couple of weeks there. I sure didn't feel like cooking, and bless his heart, as good a soul as The Cajun is, well, he's just not a nurturer. By about the 3rd or 4th call from my sick bed on the first day, I could tell I was trying his patience. He's not much of a cook either really, so as soon as I could crawl out of bed long enough to stand up in the kitchen, I put my electric pressure cooker to work on some chicken soup. Now, I won't say that it's quite as good as my stovetop version, but I will tell you it runs a very close second, and it certainly wins the prize for ease. I made this soup three times in that 2 week period of illnesses, and ate every bit of it up. With this most recent cold wave, frankly, I could go for a bowl right now! Since we don't finish up a pot of soup in one sitting, I don't typically add noodles into my soups. The pasta soaks up too much of the liquid from the broth when they are stored, leaving it more like chicken and noodles, and less like soup. My preference is to prepare any pasta I'm using separately, then put a serving of them in a bowl and top with soup. In this case, I wasn't about to boil pasta separately though, so I threw caution to the wind and put everything in the pressure cooker all at once and it worked out okay for the purpose. 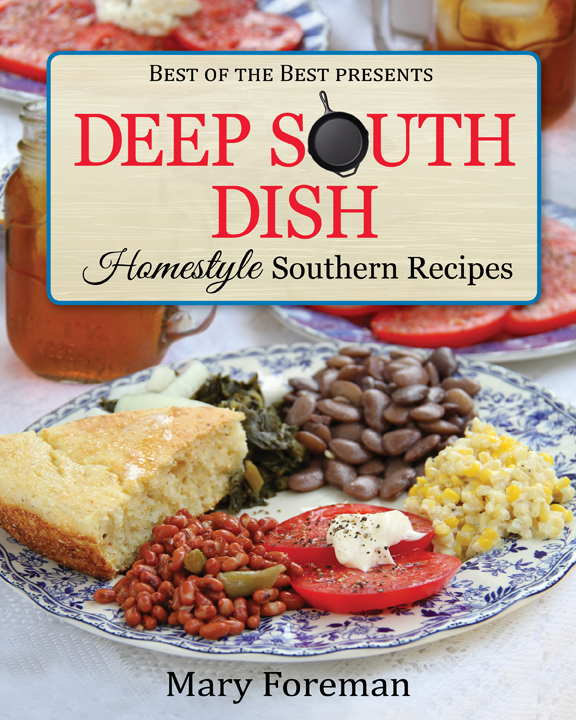 In other news, if you are one of the folks who has been asking me for years to please publish a cookbook you could hold in your hands, remember that I will be live on "In the Kitchen with David' on QVC, Sunday, March 15th, 2015 at around noon Eastern time with the debut of my brand new Deep South Dish Homestyle Southern Recipes cookbook. I am so excited! It's an exclusive, pre-launch, pre-order opportunity, so be sure to save the date and tune in, because you'll be one of the first to have it in your hands, way ahead of the nationwide debut. I hope that it's everything y'all have asked for all of these years and hoped it would be. I can tell you that it is a true reflection of my blog and my recipes, and, as it turns out I still have tons of recipes to publish, so if this one is successful, y'all just might have a volume two coming up behind it at some point! Also, even though this is a recipe website, I am still a human being living on the other side of all this chat, just like everybody else. Please keep me in your prayers for both the television debut and for peace after the passing of a beloved pet this week. I already know that many of you are pet lovers too and will understand the heartbreak I am experiencing right now. My eldest cat, Sunny Boy, suddenly passed away late Tuesday night while simply laying in my lap on my bed. The cats have their own spot with a cat condo in the mudroom where they sleep at night and when we have company, but Tuesday night I had not been feeling well, and went to lay down early to watch television in the bedroom. Because we have a Sleep Number (air) bed, the cats aren't typically allowed in there, but two of them bounded up on the bed when I went in there and I let them stay. I was dozing off when my Sunny Boy, who was laying in my lap, seemed to have a seizure, went limp and died, nearly instantaneously. We rushed him to pet emergency, but I already knew he was gone. The vet said he likely had a heart attack. I was shocked because he was a healthy cat with no obvious health issues, and was playing, eating, drinking and acting perfectly normal all day that day. I never expected this. Sunny Boy showed up on my porch 11 years ago, as a tiny kitten, one bright and sunny Sunday morning - that's how he got his name. He looked up at me and tried to meow, but no sound came out. Of course I took him in! His favorite things to do was to play in boxes and run around the house chasing my dog and the other cats. During the day, he was often curled up right by my leg, or even in my lap, as I worked on the blog, if he wasn't already snuggled up in the cat bed with my other cat and his best buddy, Smokey. I never realized that there was such a thing as sudden cat death caused by the heart - cardiomyopathy the vets call it and often the only symptom is sudden death. I've had animals all of my life and cats who lived nearly 20 years so I was not even prepared for anything like this. Whether you are a cat lover or not, I know that many of you have experienced this loss with your own pets, some of you many times like me, but it never gets easier. We love our fur babies and they truly are an important part of our family and our lives. I loved my Sunny Boy and I miss him so much every day and I am just devastated to have lost him so unexpectedly. There's no easy way to segue from that back to the recipe, so I'll just say here's how to make my pressure cooker chicken noodle soup. For those who do not yet own an electronic pressure cooker, you'll find directions for my stovetop recipe here. Add chicken and all stock ingredients to electronic pressure cooker. Seal and pressure cook on HIGH for 25 minutes. Let pressure release naturally for 10 minutes, then carefully do a quick release. Remove chicken, leave broth and veggies in the cooker and set chicken aside to cool. Pick off 2 cups of chopped or torn chicken and reserve remainder for another use. Meanwhile, for the soup, add the fresh onion, celery, carrots, pasta and the additional broth or water with chicken base. For pasta, I've used egg noodles and bow ties, but pretty much any pasta will work. Seal and cook on HIGH for 4 minutes. Carefully quick release pressure, add the cooked chicken, frozen peas, corn and parsley; simmer until cooked through. Add chicken and all stock ingredients to electronic pressure cooker. Seal and pressure cook on high for 25 minutes. Let pressure release naturally for 10 minutes, then carefully do a quick release. Reserve broth and vegetables. Remove chicken and set aside to cool then pick off 2 cups of chopped or torn chicken. Reserve remaining chicken for another use. Meanwhile, for the soup, add the fresh onion, celery and carrots, along with the pasta and additional broth or water with chicken base. Seal and cook on HIGH for 4 minutes. Quick release pressure, add the cooked chicken, frozen peas, corn and parsley; simmer until cooked through. Taste and add salt and pepper if needed. Cook's Notes: Total cook time will be dependent on how long it takes your pressure cooker to come up to pressure. 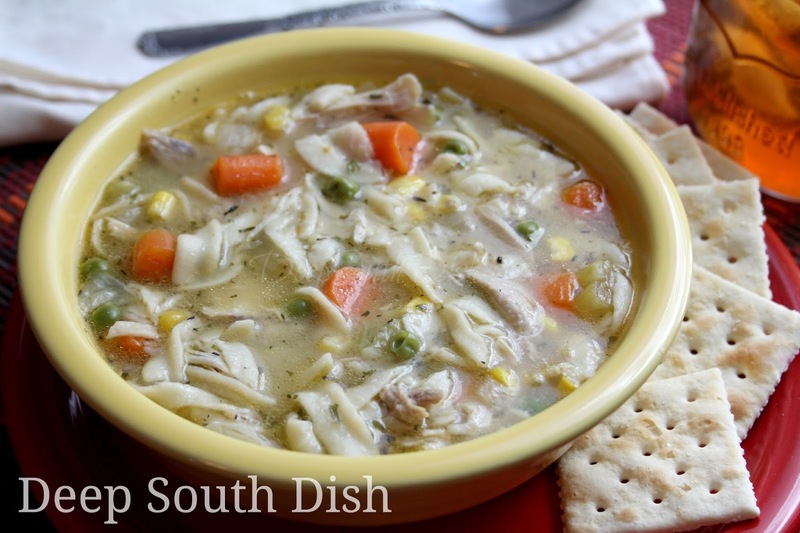 I have also used frozen, thawed boneless, skinless chicken thighs and breasts strips to make this soup, however skip the entire section on the stock. Heat 2 tablespoons of cooking oil and using the BROWN setting on the pressure cooker, add chicken and brown, about 5 minutes. Add all of the soup ingredients, except for the peas, corn and parsley, substituting 6 cups of chicken broth. Seal and cook on HIGH for 6 minutes, or until chicken is cooked through. Quick release pressure, add the frozen peas, corn and parsley and simmer until cooked through.Taste and adjust, adding salt and pepper if needed. Mary, please accept my condolences on the death of your Sunny Boy. It has only been 8 months since I lost my Sunny Bunny Boo Boo Head. I share your heartbreak and hope that you will find peace and comfort. Thank you Linda - miss you so much. I have your little gifts that you've sent to me over the years on my office bookshelf and often look at them. They always came at a time when I needed a little lift, and I think of you and your family often. I'm so sorry to hear of the loss of your baby too. I know how your heart still breaks. these beings of fur or feather or other outer shells. to be fed, sheltered, and loved. And we take them into our homes and our hearts. and rough around the edges. that tells us they are meant for us. begins with our new friends. settles comfortably into our arms. that we have often forgotten how to feel. They come to teach us to remember how to love. and a precious connection to another being. we thought was lost from our lives. our precious friends are gone. And we mourn them deeply. and that the joy is once again gone from our lives. We feel anger, and pain, and fear. We question Deity, and wonder why. Their lives are more fragile than ours. seems unfair and too much for us to bear. But they leave us always with a gift. They leave us with that love they gave, that joy they sparked. Our hearts are larger for having loved them. even if it was for too brief a time. always a part of our being. that they have been opened. so that we will have it in our hearts always. is a tribute to our pets who have moved on. Honor your special friend with kindness and love. and let them know how precious they are. and let the love your friend brought you live on. Reach out to others in need, whether human or animal. I can think of no better gift than the love they teach us. than by extending that love. In this way, they will truly live forever." Beautiful Glenna - thank you for that. I am so sorry Sunny has gone. I know how the furry ones wrap their paws around our hearts and gently knead. Of course, I will pray for comfort for you and sucess with your cookbook. I will be watching. I have followed you for sometime now and enjoy your recipes very much. God bless. So sorry for your loss. Prayers from Mississippi. I really am so sorry about your baby. My mother did tell me after the loss of her last cat, that it was almost easier that she didn't have to make the decision when they get so sick. But it's rough no matter what. Please know I'm praying for you. And the sick thing--YES! What the heck is up with that? My immune system is still all out of whack after my surgery in August. Very annoying. And, I can't wait for your cookbook. Hope you have a good weekend. Hang in there, and know we care. Thank you Julie. Today is a little bit better. Thanks Tracey. This weather has been whacked out this year! When this New England girl discovered she loved collard greens, I had to turn to the internet to find a good recipe and that is when I discovered your blog. Growing up in a family with recipes from ancestors from Sicily, Ireland, France and Germany, I appreciate good, home cooking. I believe all peace negotiations should be discussed over food, cooked by the Grandmothers of the negotiators. Comfort food lovingly cooked are unifying experiences for each of us, all over the world. My first and favorite cat (shh, don't let the others know) was going to require me to give him shots for the remainder of his life. After getting a lesson from the vet, I gave Ernie his first shot at home. He had a horrible reaction and while he staggered around the kitchen,I frantically called the vet's answering service, trying to get answers and help. While pleading for help, he struggled and died. I believe I did everything correctly, but part of me feels as though I killed him. I also know that he would have been absolutely miserable living with the life changes he was going to have to adjust to, given his condition. I doubt I will ever have a cat with such an interesting personality. I love having pets but I hate having them because their deaths are so difficult. How exciting to hear about your cookbook. I bet it will sell out quickly! First, I do agree with you about that food/peace thing for sure. Can you imagine how much more pleasant the world would be?! Second, my heart goes out to you for the loss of your precious baby Ernie. I'm sure I would have second guessed that situation myself, as I did with the death of my Sunny Boy. What did I do? What could I have done? We are just looking for an explanation but we can't blame ourselves. You did everything to help him - never think otherwise! I'm coming more at peace with the loss of my baby. Clearly he had a heart condition and I was very lucky to have had him for 11 years! Still, such a sudden death is so shocking and hard to manage in my mind, so I'm very sad, but very happy that I was hugging and loving on him all this week, so he knew he was loved when he passed. Have you heard the news about the White House Hotel? It has been revived, is open again and it is a beautiful hotel! Thank you, Mary for your wonderful recipes. Please offer more pressure cooker recipes. I got a new electric pressure cooker for christmas from my husband who grew up with a mother who used one extensively. My mom blew the lid on one and never touched it again. They scare me a little, but curiosity is winning. Being a Northern girl married to a Southern guy has been interesting. A combination of Southern and German meals gets interesting. Please offer more of the pressure cooker recipes. I follow you on pintrest and facebook. Thank you. Can't wait for the cookbook! Ha! I had that very same experience with my mom & never ever bought one till these newfangled ones came about! I'm pretty sure it was spaghetti sauce she blew up lol.. can you imagine? Oh, Miss Mary. I'm so sorry about the death of your beloved Sunny Boy. I know you're heartbroken to lose your baby so suddenly. If he had to go so soon, I'm glad he was able to go peacefully in the lap of his Mama and surrounded by love. You're a good Mama and he was very lucky to have found your doorstep on that bright sunny morning 11 years ago. Warm hugs from Texas. Thanks so much. I'm sure missing my boy tonight. I'm so sorry that you have been ill & your sweet kitty died. I have a had many cats & dogs die suddenly over the years. My husband & I are still grieving over our dog Molly who just "went to sleep" one day. They are one of the family & each time we lose one of our pets a little of our hearts go with them. I am looking forward to seeing you on "In the Kitchen with David." I know your cookbook will be a sellout! One question: I would like a signed copy of your cookbook. Are the ones QVC is selling signed by you? Mary, I'm praying for your healing, peace of mind, & your television appearance March 15. I love food made in the pressure cooker. I used one many years to cook our meals when I was working. But, now that I'm home I use the crockpot more. Both are useful in the kitchen. Thank you Tricia. I sure have been missing my Sunny Boy. That situation was so shocking - it's just hard to believe he's gone. I'm so sorry about the loss of your Molly too. You're right - they all do take a little piece of our hearts don't they? Thank you so much for your prayers & I hope that your prediction of a sell out is right - unfortunately they won't be signed copies though. 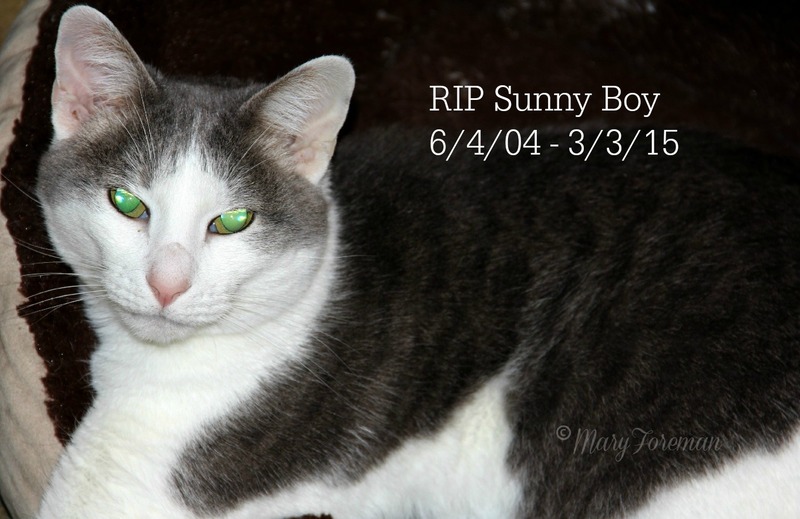 So sorry to hear about Sunny Boy! We get so attached to these furry little gifts from God. They are like our babies. We're family. I understand too well how you feel. Big Hug! We sure do. Thanks for the hugs - I'm missing my boy & it's still hard to believe he's gone. Deepest thought on the loss of Sunny Boy. They enter out world and give such joy and one moment can slip away so quickly. I was holding my old cat and the same thing happened, I looked over at my husband and told him he was gone- I had worked for vet's many long years ago. I treasure each and everyone of pawsome friends. I had the opportunity to give a home to a small stray not long after and my other animals were very happy. I love your recipes takes me to good southern cooking- I'll be getting your book. May Sunny Boy cross over the rainbow bridge and await your visit some day till then play and enjoy. Thank you Bambi & I'm so sorry for the loss of your baby too. I've had animals all of my life, all have lived long, most have lived way longer than the average so this was actually a first for me. I carried his limp little body into the living room and in shock said "Hun, Sunny Boy just died." He looked at me like I had 2 heads. I hope that's the only time in my pet motherhood that I have to go through that, but based on what I've read it's much more common that I would ever have imagined. Such a shocking way to lose a pet. I am so, so sorry to hear of the loss of your sweet boy. I lost my Bugsy the same way a few years ago, and I still feel the loss even though we have two cats still. He's with God and I'm certain He welcomed him with open arms.! Oh gosh, I'm so sorry for your loss also. It is quite a shocking way to lose a pet & I've never experienced anything like that before. I miss my boy so much but I know I gave him a good life while he was with me. Oh, I'm so sorry. Hardly a week goes by that we don't mention something about one of our cats that are no longer with us. They hold so much of our hearts. Not sure how I found your site but you can believe that I have it bookmarked already! Some awesome recipes here that I am getting ready to try, like your Cajun Sticky Chicken! Well I'm so glad you found your way here - welcome!! Super huge congrats on the book. As I just had mine published last year I know it was like birthing a baby....or twins! On the other hand, so sorry about your cat. We just lost Cocoa (90% sure the coyotes got him, they got another cat 3 weeks later) in December. He was my first cat - I never was a cat person until he won me over. Miss that little dude so I know how you are feeling. Peace. I had no idea you did a cookbook Chris - boy am I behind! Oh my. I don't even know what to say except I'm sorry. I know I would have been devastated to lose an animal that way. I love my babies so much. I'm so sorry. Just got your recipe book yesterday. They have such wonderful recipes and easy one. Love the pictures. A lot of variety, will be using a lot> Thanks for all your hard work. Thank you SO much Diane! That means a lot! !